M. A. (Sanskrit), Ph. D. (America). Publisher and Printer: Vishv Vijay Pvt. Ltd, M-12, Connaught Circus, New Delhi – 110001. (India). In recent years, some books have been published against Hindus and their religion. Most of such books are just an open demonstration of hatred towards Hindus. Such writers do not bother even to check the ‘facts’ they have been giving in their books. An ordinary reader accepts whatever is printed in a book shape. No wonder, we hear such slogans in ‘secular India’, “Tilak’, ‘Taraazu’ aur ‘Talvaar’. In Ko Maaro Joote Chaar”. The book ‘Hindu Itihas: Haaron Kee Daastaan’ (Hindu history: the tale of defeats) is though criticizes Hindus, but is free from any obvious hatred against them. Even then, there are some points, which cannot be accepted in the light of other facts, which seems to be hidden by the learned writer, who is, by chance, a Brahman by caste. How should we write our history? Should we hide our past if it is black? The writer, Dr. Surendra Kumar Sharma ‘Agiyaat’, says that Hindus have a strange conception towards history. They present the black past after whitewashing it. They hope that it will be accepted as authentic history. The writer says that inferior complex is working behind it, which is found in those people, who have some specific defect. Some friends, and enemies too, say to the writer that the filth should not be brought forward. It should be kept concealed. However, the writer thinks in a different way. He thinks that if the history is bad in reality, even then there is nothing wrong; because in that condition, we can find out what our faults were, if we analyze such history. In the first chapter of his book, the writer blames the Hindu religion for all the defeats of Hindus. Giving example of battle of ‘Trayin’ in 1192 AD, he says that it was unreligious for a Hindu to take food without taking bath and worshiping his god, so when Mohammad Gauri attacked Prithvi Raj’s (Hindu) army suddenly in early morning, they were not able to fight with empty stomachs for long. Thus, the writer blames Hindu religion for this defeat. The untouchability is another reason for Hindus’ defeat, according to the writer. Uses of elephants in wars, blind faith in religion etc were other reasons for Hindus’ defeats, the writer believes. 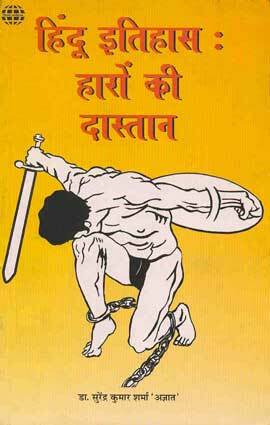 In his second chapter, ‘Kya Hindu Bahaduri Se Larhe?’ (Did Hindus fight bravely? ), the writer gives many examples to prove that Hindus did not fight bravely. For example, he says that when Sikandar attacked India in 327 BC, the King of ‘Takshila’ Raja Ambhi sent an envoy to Sikandar and surrendered before him. Sikandar had 15, 000 armymen and King Porus had 33, 000 armymen, even then Porus was defeated by Sikandar. In 250 BC, the Bactrian Greeks attacked India. In 180-90 BC, Demitriyas attacked. His military chief Minendra reached Patliputra. Then came ‘Pahlavs’, who started to capture parts of Sindh. Then, ‘Shakas’ came and they occupied Saurashtra, Gujrat and Avanti. After Shakas, ‘Kushaans’ attacked India. They conquered Punjab, Sindh and Mathura. Their King Kanishka conquered Bihar and Kashmir. In 455 AD, the ‘Huns’ started to invade India. Even after this, another races, like Jats, Gujjars and Aheers etc continued to come here and established their kingdoms. In 653 AD, Abdul Rahman occupied Jabul. In 712 AD, 17 years old Mohammad Bin Qasim attacked Sindh and then occupied Brahmanabad, Allaur, Multan and Kannauj etc. In 1018 AD, Mahmud reached Buland Shahar and the local ruler Hardatt surrendered before him and embraced Islam along with his 10, 000 people. When Mahmud reached Mathura, the local residents and soldiers ran away without giving a battle. Same happened in Vrindavan. In January 1019, Mahmud attacked Kannauj. The King of Kannauj Rajpal did not dare to oppose him. Mahmud got lots of money, slaves and elephants from Kannauj. In 1192, Mohammad Gauri defeated Prithavi Raj Chauhan and killed him. There were 1, 20, 000 armymen in Gauri’s army. On the other hand, there were 2, 00, 000 horsemen, 3, 000 elephants in Prithavi’s army. In 1197, Mohammad Gauri’s general Mohammad Bin Qasim Bakhitiyar attacked Bihar and Bengal along with only 18 horsemen and captured them. He killed thousands of Budhists there in Udandpur. In 1221, Changez Khan came. He killed many people and set many villages on fire. In 1398 Temur Lame attacked India and killed 1, 00, 000 people in Delhi. He reached Hardwar (a sacred city of Hindus) and killed many people. Then he reached Jammu. The local ruler became Muslim along with his people. In 1527, babur attacked Rajput warrior Rana Sanga. Babur had 30, 000 soldeirs. Rana Sanga had 2, 01, 000 soldeirs and 1, 000 elephants. Even then, Rana Sanga was defeated and he ran away. In 1562, King Bihari Mal of Jaipur surrendered before Mogul King Akbar and married his daughter to Akbar. When Akbar attacked Mewar in 1568, its King Rana Uday Singh ran away and his generals Jaimal and Phatta fought against Akbar. Akbar won and captured the capital. In 1569, Akbar sent his army towards Ranthambhor. Its King Surjan Rai surrenedered in two mintues. Raja Ramchandra of Kalinjar also surrendered before Akbar’s army. King Chandrasen of Marwar himself appeared in the court of King Akbar and surrendered. All the Rajput Kings of Bikaner, Jaisalmer, Jodhpur etc surrendered before Akbar. In 1761, Ahmad Shah Abdali attacked India and defeated Marathas in Panipat. In the third chapter of his book, the writer questions the ‘morality’ of Hindus. He tells that Krishan encouraged Yudhishthira to tell a lie to kill Dronacharya. Bhagwan Ram killed Bali against the rules. Brahman Pushyamitra killed his own king Brihthrath. King Devbhoomi was killed by his minister Vasudeva. The Hindu queen poisoned his husband King Bhatti Rai of ‘Uchch’. When Sikandar attacked India, Chandragupt Morya gave him a beautiful girl, a philosopher and some other articles as ‘gifts’. Rana Sanga himself invited Babur to attack India and its capital Delhi. In the fourth chapter of his book, the writer quotes Rigveda, the sacred book of Hindus, and other Hindu books to prove that Hindus were not non-violent people, as has been said by some foreigner writers. In fifth, sixth and seventh chapters of his book, the writer has quoted to different religious and other books of Hindus and tried to prove that it was these books, which were responsible for Hindus’ defeat. The writer reaches on conclusion that Hindu culture and Hindu religion are responsible for India’s slavery. This entry was posted in Uncategorized on February 28, 2008 by admin. Good review. Writer of the book is biased on many points.